Crunchy and spicy long-cut banana chips. 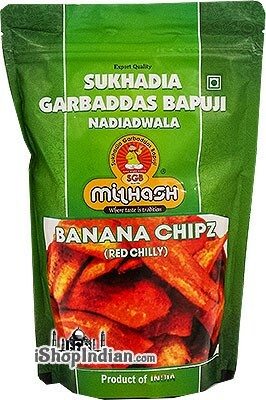 INGREDIENTS: Choicest Bananas, Iodized salt, Red chilly, Edible oil. 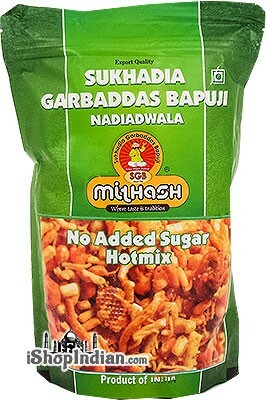 Ingredients: wheat flour, palm oil, salt, red chillies, black pepper, cinnamon, clove, bay leaves, sesame seeds, fennel seeds, sugar, coriander, cumin, shredded coconut, turmeric, cassia, cassia leaves, triphala, asafoetida. 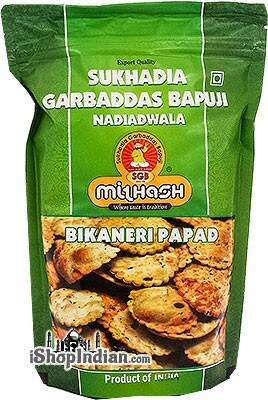 Sukhadia Garbaddas Bapuji brings you the very popular bikaneri papad, the flavours of which is bound to amaze you. 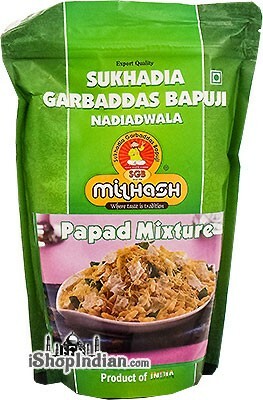 With delicious taste and a blend of aromatic spices, these papads have found a place in every Indian household. 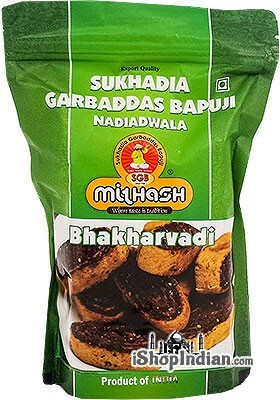 INGREDIENTS:Gram flour,Black Gram Flour, Iodized Salt, Asfoetida, Black Salt, Sodium Bicarbonate, Black pepper, Red Chillies,Edible Palm Oil. 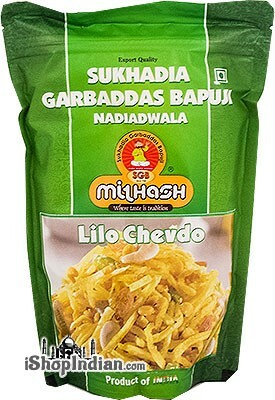 Special mix of chickpea flour strings and lentil chips with no added sugar. Contains 0.83 gm sugar per oz. 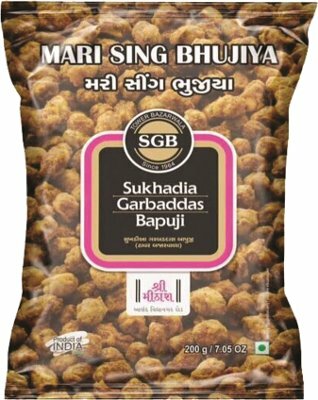 INGREDIENTS: Chickpea flour, chickpeas seeds, Edible palm oil, Ground Nuts, Sesame Seeds, Lentil Seeds, Asfoetida, Bay leaves, Black cardamom, Black pepper, , Black salt, Caraway, cassia, cassia leaves, Citric acid, Cinnamon, clove, Coriander, Cumin, Dry Ginger, dry mango, Iodized Salt, Soda Bicarbonate, Turmeric. 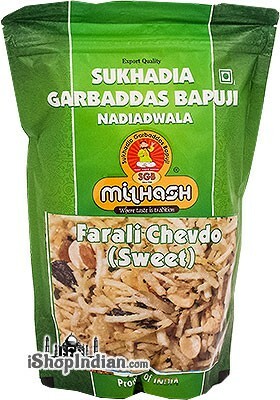 Crunchy puffed rice and lentils strings snack. Lightly seasoned. 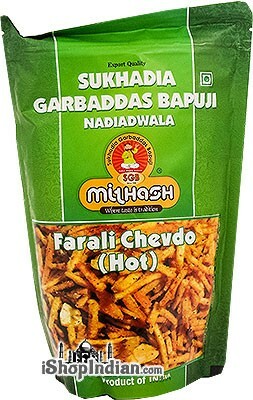 INGREDIENTS: Puffed Rice, Salt, Sugar, Black Pepper, Red Chilli, Asfoiteda, Chickpea Flour, White Chilli, Black salt, Dried Mango, Fennel Seeds, Edible Palm oil, Curry leaves,Caraway Black gram flour,Sodium bicarbonate. 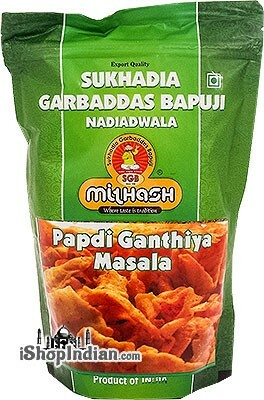 Wheat-free chickpea flour chips in a thin spicy coating. 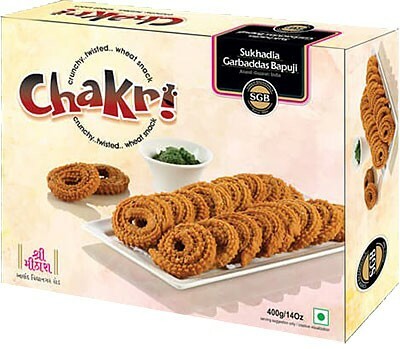 INGREDIENTS:Chickpeas Flour, Edible Palm Oil, Iodized Salt, Red Chilli Powder, Rock Salt. 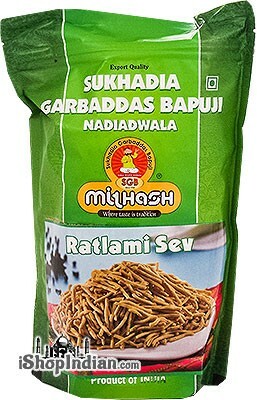 Ratlami Sev is a popular Indian snack food consisting of crunchy lentils noodles. 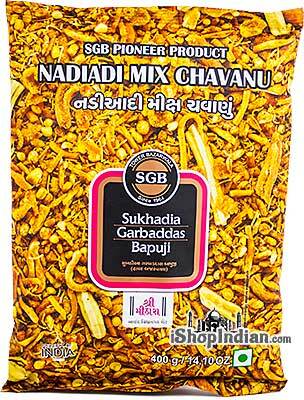 INGREDIENTS: Chickpeas Flour, Edible Palm oil, Iodized Salt, White Chilli, Asfoetida, Black Pepper, Clove, Caraway, Black Salt.